At the door the day of each performance beginning at 6:00. 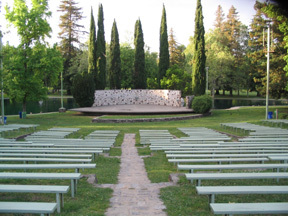 As this is a city park, we have limited ability to change the natural setting of the amphitheatre or the park. We will make the amphitheatre as accessible as we can and work with our guests to accommodate their needs. 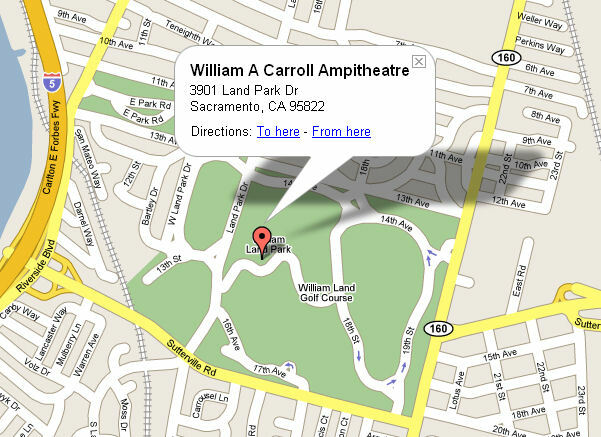 Box office opens at 6:00, gates open at 6:30, GreenShow 7-minute performance starts at 6:45, curtain is at 7:30pm. No children under 6 years old allowed at any performance. A blanket or a sweater, because even the warmest days will feel refreshingly cool late into the evening! Blankets will be available to rent for a small donation. Short lawn/beach chairs for the lawn area, taller chairs to sit between or in front of the benches. No tall chairs on the lawn area. Blankets are great for the lawn area as well. Amphitheatre is equipped with backless benches. Sit closer to the stage to get the best audio experience. Stadium chairs are available for rent on a first-come, first-served basis. A picnic to snack on before and during the show. Bug Repellent, remember we are outdoors! But please, no candles. Cash, checks or credit cards to buy your tickets at the park. Small bills for concessions during intermisson. Get here early if you wish to sit in the front lawn area as it usually fills up first. No photography or video recording of any kind allowed during the performance. Refrain from texting, phone calls or using your phone during the performance. The light is very distracting to your neighbors and it can be seen from stage. No smoking (cigarettes, cigars, pipes and vapes) is allowed within the limits of any city park. For special needs in seating, accessibility, or group reservations, please call Luther Hanson at (916) 558-2173 or email at hansonl@scc.losrios.edu. 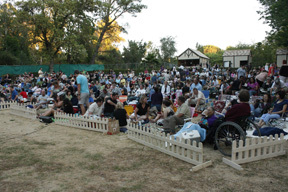 City of Sacramento parks are open from sunrise to sunset. Smoking is prohibited in all City Parks. Parking lots are subject to patrol by City of Sacramento Police Department. Alcohol is not permitted in city parks without a permit.